Coleen's Recipes: KID FRIENDLY JELLO FROSTING!! UPDATE: New sugar free option at the end of this post. UPDATE: Since posting this on Pinterest, a few people have commented that this frosting deflated on them after a day at room temperature. I've never had this problem, because I live in a DRY climate, but those of you living in HUMID climates are having this problem. So... if you live in a humid climate, you'll need to store the frosted cake in the fridge. This frosting recipe has a lot of things going for it. It is fast, super light, smooth and creamy on the tongue (very similar to a 7 minute frosting, but so much easier). Neatest of all, is that it is flavored with jello, so you can make it in ANY Jello flavor you like...watermelon? blueberry? pina colada? Kids will LOVE this frosting. Place the Jello powder, granulated sugar, egg white and vanilla in a GLASS OR METAL mixing bowl of a stand mixer. DO NOT USE PLASTIC and make sure your glass or metal bowl is clean of any grease or oil. NOTE: This recipe only seems to work if you use a stand mixer, with whisk attachment. Also, make sure you use a glass or metal mixing bowl, do not try this with a plastic bowl. NOTE: Some people have commented that they don't think raw egg whites are safe for children to eat. The egg whites in this recipe are no longer raw after you add the BOILING WATER. NOTE: This recipe makes enough to frost 24 cupcakes, or a 9 x 13 cake. If you are going to do any piping or edges, you might have to double the recipe. NOTE: This frosting pipes beautifully and holds its shape well. Like any 7 minute type frosting, it does get a little sticky/tacky the second day, so its best if you make it the day you want to serve it. If you have to make it the night before, just store it in an airtight container that doesn't touch the frosting. NOTE: This frosting has so many fun possibilities for birthday cakes/cupcakes. It would also make a wonderful filling. 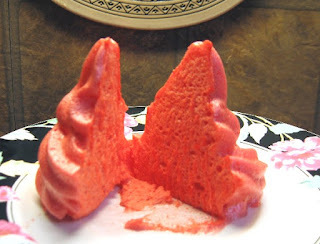 Since putting this recipe on Pinterest, I have heard from several people who are wondering about the possibility of sugar free jello and Splenda...well, I had to try it. I used 2/3 cup of granulated Splenda, 1 egg white, 1 teaspoon vanilla and a small (4 serving) size box of sugar free jello. I mixed those items together in my stand mixer and added 1/2 cup of BOILING (not just hot) water while the mixer was running on HIGH. Let the boiling water run down the inside of the mixing bowl, so it cools off a couple degree's before hitting the egg white. 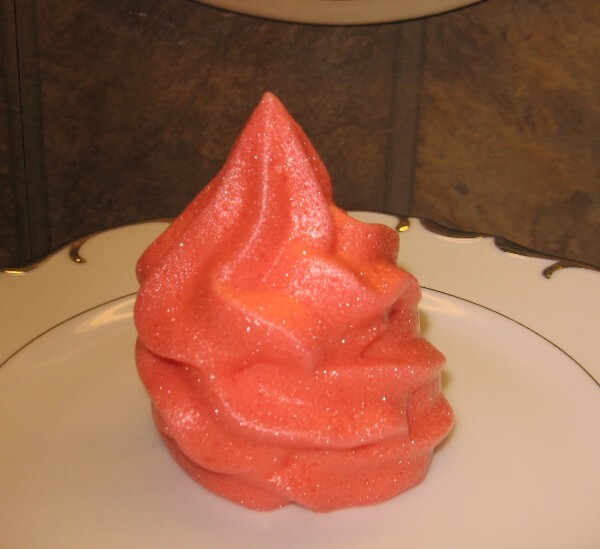 I'm not sure whats up with the sparkle; the final frosting DID have a "fairy tale shine" to it, and I thought perhaps it might have a granular taste, but it didn't; it was very smooth. I let this frosting sample set out at room temperature for several hours to see if it would deflate (it didn't), but it did form a VERY THIN crispy crust (keep in mind I'm in a dry climate). I also put a similar frosting sample (uncovered) in the fridge and after a few hours, there was NO appreciable difference between it and the sample I kept at room temperature. I cut the frosting sample in half... it tasted sort of like a cross between a sweet meringue and a wet marshmallow whip... does that make sense? My conclusion: We liked the original recipe better, however, if your dietary concerns require a sugar free frosting, this is worth a try!! Wow! I am glad to see this recipe. I can see great possibilities for something like this. Thanks again. I can't wait to try this. It looks so yummy. I think lots of adults will love this, too. i can't wait to try this, a family pleaser for sure! Oooo, this will be fun with all those flavors out there! VERY cool! Pina colada sounds yummy! How creative! I make "rainbow jello" which has become the one recipe that attracts visitors to my blog, so this recipe is a neat twist on how to use jello! I love using jello around color-themed holidays (St. Patty's, Christmas, Easter) because you can choose any color you want! Thanks for the great recipe and post! Very clever idea. It looks so fluffy and creamy and your piping is wonderful. I don't want to make a whole batch, I just want to steal a cupcake of yours! I made this yesterday. You're right it becomes sticky after sitting at room temperature for a few hours. I think this is best eaten soon after you frost the cupcakes. 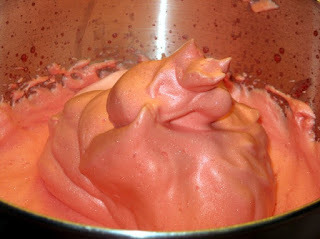 Made the kid friendly jello frosting today with Strawberry. It tasted amazing!! We loved the flavor! The color was great too. But I could not get mine to thicken up like your's did to pipe it. I beat it for 10 mins and it was still soupy. I even tried some cornstarch but that didn't work either :( It's alright though I just served the cupcakes in dessert bowls and poured it over!! Thanks for the recipe! To Anonymous: Did you do it in a plastic bowl? It could be that grease on plastic bowls or utensils was the problem. Next time, try a glass or metal bowl. Yes, put all of the boiling water in at once. I came over from Lynn's. Will the icing hold up for a few hours? To Kathleen: The icing will hold up for a couple days easily, although it will form a "skin" on it. If you don't want the "skin" which can be sticky to cut through, just cover the cake and no "skin" will form. I had an issue with the frosting not forming peeks had to add 4 teaspoons corn starch to thicken it up. I was using a Kitchen Aid 4 1/2 quart metal bowl. Any ideas on how to do this without the corn starch? To clb1484: I have never had this recipe fail on me. To anonymous: Read the recipe again, you add BOILING water to the egg whites, that means they are no longer raw. I made this amazing frosting yesterday and about 4 hours later, it started to break down and become frothy...no creaminess to it :( Didn't whip it long enough, maybe?...or too long? To Anonymous: I have NEVER had a problem with this frosting, I'm not sure what went wrong for you. Has anybody tried using this recipe for a cake filling? I want to try it with my birthday cakes but curious to know how it comes out (texture and taste wise) a day after. I usually frost/deorate cakes a day before pick-up or serving to guests. For the cupcakes. I have a kitchen aid stand mixer, will that work? To Anonymous: Yes, I make this with my kitchen aid stand mixer. This looks like so much FUN! I am planning to make cupcakes soon and was going to make vanilla or chocolate frosting, but I just might have to make Jell-o frosting instead. I'll bet it would be great with raspberry Jell-o! 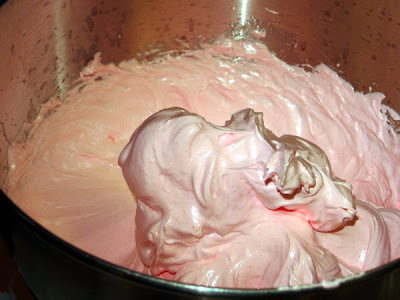 Have you ever tried making this frosting with unflavored jello and then adding a flavor extract???? I want to try this frosting but do not want a fruit flavor. To Mary: No I have not. this was awesome wanted an icing without all that icing sugar. not to mention the ease of putting everything in my stand mixer and letting it make itself. Thanks so much for posting this. Just wondered if anyone tried a sugar free variation of this and how it turned out? I'm so excited to try this! I am wondering if you have ever tried it with the jello pudding? (for a chocolate or vanilla icing). Thanks! To Ali: pudding would not work. as I'm a beginner, by Jello, you mean the jelly "powder"? or the nearly hard cubes of jelly? To Leily: just regular Jello powder. 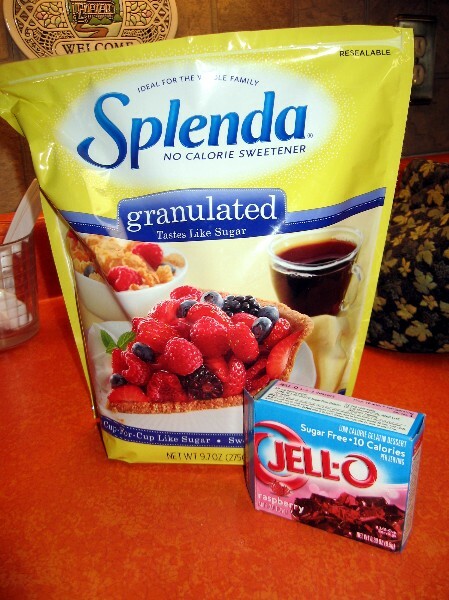 Would the cup for cup Splenda and sugar free jello work? Great recipe, thanks so much! just tried it and kids love it. Do you need to refrigerate the left over cupcakes and frosting? HAS ANY CANADIANS MADE THIS RECIPE? IS IT A 57GM BOX OF JELLO or more because 57 gms converts to only 2.011 ounces? To Annonymous: you don't have to refrigerate this frosting, but you should cover it well so that it doesn't form a tough skin on the surface of the frosting. To Canadian anonymous: I suggest you use the full 3 ounces of jello. Do you have a scale? Canadian measured out 3 ounces, made it - it turned out great - seems very sweet though? I am very worried about the raw egg white, especially for kids! Jo Peterson: After you add BOILING water, as per instructions, the egg white is no longer raw. I have a bosch stand mixer which uses a plastic bowl. Would you suggest using a metal bowl and a hand mixer or trying the stand mixer with the plastic bowl it uses? momyshaver: I have not tried this with a plastic bowl. Would sugar free jello work? The box says it's only .44 oz. would you have add more boxes?? will it work with regular mixing tools i don't have a whip tool for my mixer. I know this recipe as "Butterfly Icing" ('cause it's light!) It does work with a regular mixer, but it just takes a bit longer. If people are having issues with it setting they can try adding a bit of Cream of Tartar (1/2 tsp.). I do find that even in my DRY weather it is best used the same day. It is the only icing I use on ANGEL FOOD CAKE, because it is so light! Thanks for sharing, I found this on Pinterest! You are right about this frosting not doing well with humidity. I had to add extra sugar and beat it forever and it still flopped after a few minutes. I'm glad I let it sit before frosting the cakes just in case. You just can't have frosting in an Aussie summer. I'm going to add more sugar, whip it again and bake on low heat to see if I get meringue. I'll try again in Winter- the traditional baking season around here. I just made this frosting and it is AMAZING!!! Forget the cake, just eat this! I just made this, it turned out wonderful! but I had one problem, when the frosting was done it had little specks of jello powder, any idea how I can fix this? What about using powdered sugar with sugarfree jello? What about also adding some heavy whipping cream? No one ever said if they tried to use this as a filling for cupcakes or angelfood cake. Im hoping this may negate the sticky skin its said to get on it. I am dying to know if this is even feasable. Anyone? After nine consecutive days of coping frosting recipes from the internet, this… your frosting was by far the best!!! I DO NOT like buttercream frosting/icing!!! I love cream cheese frosting but I can NOT use it because my cupcakes will be out of the refrigerator at room temperature of 75 degrees. I tried wedding frosting/icing… WAY TOO SWEET!!! I found this recipe on Pinterestmonths ago and hadn't found an excuse to try it.... Until now. I'm doubling the recipe and I live in Texas, and it's July. Today also is pretty humid. It's taking longer to make peaks, but that is totally fine because it tastes DIVINE! 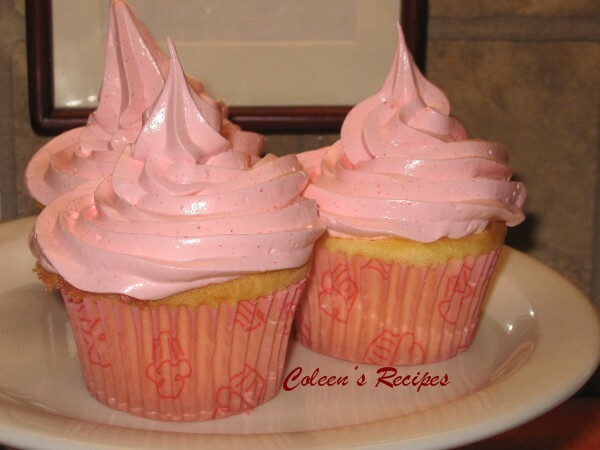 We're doing watermelon today, and my daughters' scout troop will love these cupcakes tonight! Thanks for sharing! Colleen, have you ever made this using meringue powder as a substitute for the real egg white? If not do you think it would work the same? THIS WAS ABSOLUTLY WONDERFUL!!! Like eating a strawberry cloud on a cupcake! Thanks for sharing! No problems your directions were great! The boiling water cooks the egg whites. Kids lick cake batter all the time and never get anyway. It was awesome! It worked just like the original recipe. The key is always having absolutely NO oil/grease on implements or bowl, of course. This is a terrific recipe. So glad I found it. Would this frosting work with a "no cook" chocolate pudding mix? Answer to Brenda: No, it wouldn't because the frosting is gelatin based. To Nattie: I have never tried this recipe using meringue powder. Love this receipe .. turned out wonderful .. and tastes really good. . thanks for sharing !! Colleen - I just found your site today, and have been bookmarking like crazy. I love the way you write in your posts, your comments on the taste/texture's, and your humor. This is the first recipe I've gone down to read the comments underneath, and I just wanted to add my own to the list. It's not a comment about the recipe at all, but directly to you - you have *incredible* patience and grace in your replying. Just reading these comments I was becoming *so* frustrated the further I went down that people kept asking the same questions others had already been posted (and you'd replied to! ), they'd wanted to change the recipe and make it something else (and wanting your input on how to do it! ), or complaining because they hadn't read the post fully about the eggs (or comments below that were *answered* - many times!!). You are incredible, and I take my hat off to you. Besides all of that, your recipes look amazing, and you do your posts so well. Thank you for taking the time to post them & your thoughts so that we may learn, succeed, and improve in our own kitchens. :) Take care! ended up adding a ton of cornstarch to make an odd tasting icing..... not too bad but i am very disapointed that i couldn't get frothy icing like the photo. trying again!!!!!!! TO DANCERKIDD: I can only assume that you had traces of grease/oil on your beaters and/or bowl. I have NEVER had the problem you are describing, but that is exactly what it would do if your utensils had oil on them. It would also cause this problem if you use a plastic bowl. Can you make this without the vanilla extract?? I read through the comments just to see if someone had asked this already but I did t see it. So I apologize if i issued it. To Super Woman;;;;;;;;;;;; I don't see why not. Just tried this with Piña Colada flavored jello mix and put on a strawberry cake. Tasted great and made a bright white frosting which is what I wanted. Turned out exactly as described. I have a Kitchen Aid mixer - mixed on high speed for about 7 minutes. Ate the cake within hours after making it but it did get a bit soft and a little foamy overnight, but still tasted great. Will try refrigerating leftovers next time. Can't use egg due to allergies. What can I use instead?